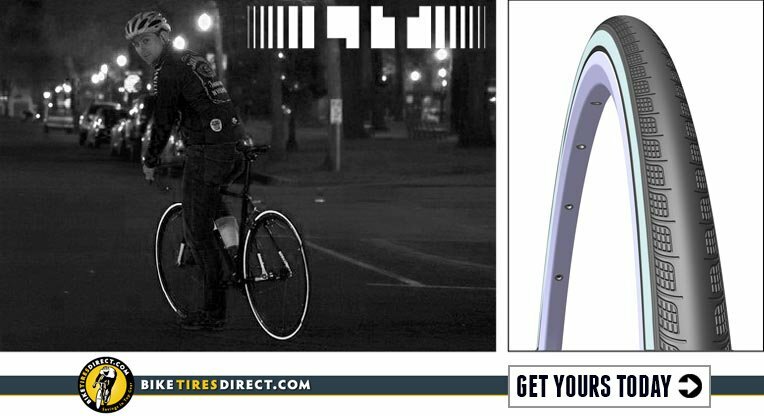 BikeTiresDirect is committed to bringing our customers the latest and most exciting products, which is why we've teamed up with a local company, LIT Cycling, to bring you a revolutionary new reflective bike tire. LIT Cycling, a Portland-based company (like us! ), has developed a new take on the reflective bicycle tire. Designed with all-season road riding and urban commuters in mind, the tire's high-profile reflective sidewall is visible from virtually 360 degrees. It's very lightweight and puncture-resistant. The end-result is a tire that increases overall rider visibility during times of low light while maintaining performance-oriented features. The few reflective tires on the market today are heavy, bulky wire-bead tires; LIT's lightweight, high-visibility, Aramid-bead folding tire is unmatched by the rest of the industry. The first LIT tires will be produced in a 700c x 28mm size. This production run was funded 100% on Crowd Supply in May 2013. LIT has partnered with a major European bicycle tire producer for their manufacture. The tires are currently available for for sale on BikeTiresDirect at a price of $49.99 per tire. Get 'em while they're hot! Also, be sure to check out LIT's website here.